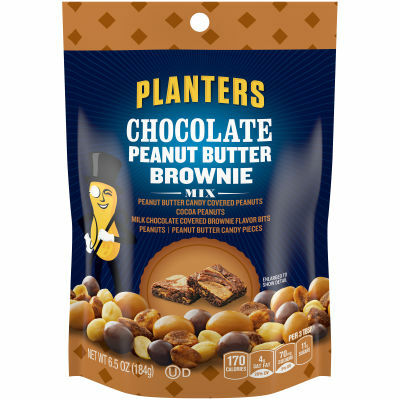 Experience the delightful taste of a peanut butter brownie without indulging With Planters Chocolate Peanut Butter Brownie Mix, you can enjoy all the flavors of your favorite dessert in a handful of peanuts, peanut butter candy pieces, peanut butter candy covered peanuts, cocoa peanuts and milk chocolate covered brownie flavor bits. - This mix can be enjoyed on its own or as a topper on an ice cream sundae for added flavor. Available in a resealable 6.5 oz. bag, this peanut butter brownie mix can be kept fresh and enjoyed time and time again.